This is a eco-friendly water-based air freshener, use hi-tech packaging technology. Patented technology (compartmental package) developed by our company, non-flammable and non-explosive, safe in use, no irritation. Do a good job in getting rid of all kinds of odors, smell good and naturally, long-lasting. After use, people would feel relaxed and refreshed, like in the place of nature. 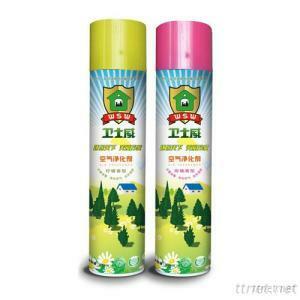 There is no need to shake the can, just spray into the air, depending on what you need, you can use the adjustable sprayer, spray for as many times as you want in any angle.